Usually sometime on New Year’s Day, in the middle of trying to relax into the idea that it’s a whole new year while also trying not to think about whether or not I feel like I really made the best use of the last one, I have the sudden realization that it is officially time to do my taxes. The unpleasant necessity of this chore then reappears at random intervals in my mind, like a whining mosquito in my ear, until I can finally clear out a day or two to sit down and get it over with. This year, I had to set up an extra table in the living room to do my taxes. At a certain point I ran out of space for piles on the table, and just started making my two “discard” piles on the floor — flinging papers in one general direction for recycling, and in another for shred-first-then-recycle. This is when the first of my helpers showed up. Hiro came along, and as cats are wont to do, sat on a pile of papers and looked around himself as if this was a grand accomplishment. Since I doubted any attempt to remove him would be successful, I just kept tossing papers and used envelopes at the pile he now occupied. It turns out that, if you’re a cat, having envelopes flung at your head is great fun. Much leaping, shredding, and crazed gnawing ensued. I continued tossing and he continued pouncing, and a good time was had by all. Eventually he wore himself out and left to take a nap on the couch. I soldiered on. This is when Helper #2 showed up. One of my piles was tossed on top of the towel-covered rabbit carrier, which is Ziyal bunny’s favorite place to leap up and Survey her Domain. Apparently it was Not Okay that I had appropriated this surface for my own purposes by covering it with receipts in need of shredding. She hopped up onto the pile and glared at me in the extremely ineffective way that only a cute fluffy bunny can fail to glare. Staring at me pointedly, she grabbed a receipt from under her front paws and began biting big chunks out of it. I’m not sure what action on my part, if any, she thought this would inspire, but I’m pretty sure grabbing my camera wasn’t it. Her list of desired reactions really only has one item on it, and it involves me administering blueberries. But there she was, sitting on my to-shred pile, helpfully shredding receipts. Maybe I wouldn’t need to empty the full-to-the-point-of-not-working electric shredder after all. Maybe the bun-bun would finish the job for me. So I crouched there with my camera taking pictures, while Ziyal eyeballed me suspiciously, a piece of paper dangling from her mouth. After seeing this photo, my sister reminded me that when I was seven or so, I wrote to the President of the United States to suggest that all paper shredders be replaced by gerbils. When I was seven, I had a somewhat skewed perception of Presidential Powers. All I really knew was that a) the President was the most powerful person in the country, and therefore could presumably do anything, and b) that when people had something to gripe about, they wrote to the President (in retrospect, there isn’t anything about any of those ideas that doesn’t seem quaint). I also felt that there was a Matter of Some Urgency to my cause. The 70s were only recently over, and the gasoline shortages of 1973 and 1979 were still fresh in everyone’s minds. It wasn’t uncommon to see stickers in public bathrooms about using the electric hand dryer instead of paper towels to save trees, and to please turn off the light when you left to save electricity. My parents were also children of the Great Depression. I grew up in a family where waste was anathema. My mom still brags about how many times she can reuse a tea bag, although she now revels in shopping at Macy’s instead of Sears. 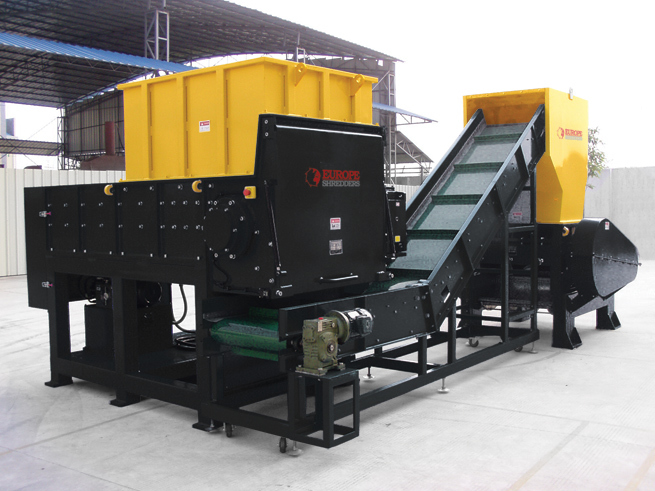 Industrial shredder. Photo courtesy of Wikimedia Commons. Useful, but you don’t want to pet it on your lunch break. In any case, the Matter of Some Urgency that spurred my putting crayon to scrap paper to bend the President’s ear was my Opinion that gerbils would be a much more energy-efficient means of shredding paper. My dad had described the industrial-sized paper shredders they used at the plant where he worked. I had come to understand that paper shredders went hand in hand with paperwork, that adults generated a lot of paperwork, and that having created it, it was somehow important to then destroy a good portion of it. The government created more paperwork than anyone else, and with all those super-secret forms filled out in quadruplicate, they had a lot to shred. I also knew that paper shredders required electricity. Gerbils, on the other hand, only required food and water and to have their cages cleaned once in a while. Gerbils employed as paper shredders wouldn’t need bedding, as they’d be making it themselves out of discarded documentation. So on the basis of this information, I surmised that large cages full of gerbils would be more energy-efficient than electric shredders. A stack of adorable gerbils. Seriously, wouldn’t you rather have these at work? Photo from Besquailey on Cutest Paw. Besides, who wouldn’t rather have a dozen adorable gerbils at work instead of a boring and noisy electric shredder? Surely the President could see the sense of my Urgent Suggestion? It never occurred to me that, although the President has many powers, commanding people to use gerbils instead of paper shredders might not be one of them. He was the President, right? Presidents can do anything. ***I haven’t vetted this site. I’m not responsible for anything that happens if you actually do this. Just sayin’.